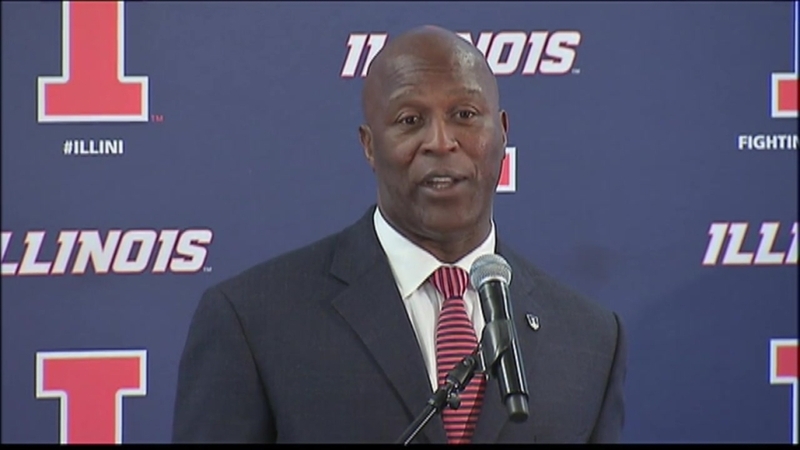 Lovie Smith officially found a new home at the University of Illinois. Athletic Director Josh Whitman announced Monday in a series of photos that Smith will become the university's 25th head football. The university introduced Smith at a press conference in Champaign on Monday, and the coach quickly went to work establishing what he intended to do as he takes the reins. "We want to get to a place where we're competing for Big Ten championships yearly," Smith said. "This is an exciting time for Illinois football, and I can't wait to take us to that next level." Smith, who was fired by the Tampa Bay Buccaneers after two seasons at the helm, will come back to the college ranks for the first time in two decades, with his last experience coming at Ohio State in 1995. Josh Whitman confirmed that Smith had signed a six-year contract with the university, which will pay him $2 million in his first season and $6 million in the final year of the contract. Despite his constant presence in the NFL over that time, Smith has no intention of coaching for a few years in Champaign and then jumping back to the pros. "This is the third quarter of my career," he said. "I signed a six-year contract. I'm not going anywhere. This is where I want to finish my career. We're here for the long haul, and I embrace that challenge." The challenge facing the Illini is a stern one. Not only has the team struggled to recruit locally-grown players in recent years, but they haven't had much success on the field either, making just one bowl appearance in the last four seasons. They finished with a 5-7 record during the 2015 season, leading to Bill Cubit's firing and Smith's hiring as the head coach. “I am extremely excited to be named head coach of the Fighting Illini,” Smith said. “Josh approached me about this possibility, and I immediately seized on the opportunity to make a difference in the lives of the young men who are part of the program today and in the future." The news comes just days after Whitman fired Cubit on Saturday. After the firing numerous reports speculated the Fighting Illini were quickly making strides over the weekend to name the former Chicago Bears head coach to the same position at the school. The move was a complete stunner from the university, which gave Cubit a two-year contract extension at the end of the 2015 season. Whitman took over the school’s athletic department officially on Saturday, and his first action was to fire Cubit, just one week before the team begins its spring practices. Smith has not coached in the college ranks since 1995, when he was a defensive backs coach with the Ohio State Buckeyes. Before that he coached linebackers at four different schools, including Wisconsin and Arizona State, and he also was a defensive backs coach at the University of Tennessee. Since then, all of his experience has been at the pro level. He’s had two different stops as a head coach in the NFL, including the Bears for nearly a decade and the Tampa Bay Buccaneers for the last two seasons. Tampa opted to fire Smith after the 2015 campaign however, freeing him up to pursue other coaching opportunities. Smith's hiring is the biggest coaching splash Illini has made as a program since they hired Ron Zook in 2005 after a stint with the Florida Gators. Smith is a significant upgrade in terms of notoriety, and because of his reputation as a player’s coach, could help the Illini establish an identity on the field that they have sorely lacked since Zook was fired after the 2011 season.